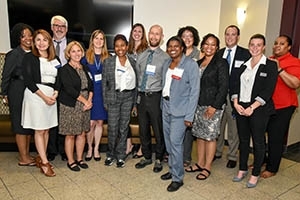 Summit Highlights the Ways Research Can Shape the Federal Workforce | News | School of Public Affairs | American University in Washington, D.C.
At two million strong, the federal workforce is bigger than nearly all Fortune 500 companies. It is responsible for managing many aspects of the ways Americans live day to day. With this many employees, how can government ensure the best available research is driving human resource and operation policies for this important sector? As part of the effort to foster a culture of inquiry and collaboration that drives effective Federal workforce policy, on June 7, for the second year in a row, AU's School of Public Affairs partnered with the U.S. Office of Personnel Management to host the OPM Research Summit, "Transforming Human Capital Management Policy through Research, Innovation, and Analytics." The 2017 Research Summit brought together 300 academic researchers, federal practitioners, and industry partners to share research, exchange ideas, and to participate in critical conversations about ways to transform Human Capital Management Policy through research, innovation, and analytics. Anjali J. Forber-Pratt, paralympic medalist and assistant professor at Vanderbilt University, gives a keynote presentation at the OPM Research Summit. This year, the summit focused on four specific tracks: performance management, diversity and inclusion, workforce reshaping, and analytics and technology; with the goal of developing a research agenda that will help shape the federal workforce for years to come. The Research Summit offered strategies, research, and lessons for attendees to apply at their respective agencies. For instance, in a few short decades, our country will no longer have the diversity gaps of today. Attention to diversity and inclusion can ensure the federal government's workforce is as diverse as the people it represents. "Research can help us understand the strategies on how to include employees no matter a person's race, ethnicity, background or beliefs," SPA Dean Barbara Romzek said in the closing remarks. "I know that at American University, we have made great strides ensuring diversity in our academics, students, and faculty. But this is a process, and we still have work to do. The norms of our culture need to reinforce inclusion. We need to make inclusion the expected behavior, not exceptional behavior." In practice, many diversity programs focus mainly on achieving demographically diverse groups. Intellectual diversity, or the wide variety of perspectives and values people bring, also matters. Diversity of problem solving styles is also important. As several OPM Research Summit speakers pointed out, diversity in all its forms needs more attention. "The power of human capital cannot be underestimated, and we ignore it at our peril," said SPA Senior Associate Dean Vicky Wilkins. "This year's summit sparked new conversations that highlight core human capital challenges facing the federal government, and inspire the development of a research agenda that informs the evolution of workforce policy into the future." The Summit also covered how there are growing opportunities to collect and leverage digital information. The increase in digital data has led many government managers to change how they make decisions. Managers today rely less on intuition and more on data. "Data analysis is a high priority for OPM and for American University, which is constantly exploring new ways to use data to inform policymakers," said Wilkins. "In fact, our school is getting ready to launch a new research center this fall that will be focused on data science and we are developing an Master's degree in data analysis." Research shows that high-performing organizations succeed when employees are highly-engaged. Agencies should continue building on the recognition that employees work best when they are motivated to succeed. That motivation relates to the work itself and the environment within which people work. Leaders who recognize that employees are affected by how they are treated at work will increase employee engagement and enable higher performance. "When we draw on the knowledge of a diverse workforce, we are better able to distinguish the best possible way to serve our customers, the American citizenry," said Kathleen McGettigan, Acting Director of the U.S. Office of Personnel Management. "We must create the right opportunities for the needed, but sometimes challenging policy discourse." Learn more about the Office of Personnel Management and use the resources from last year's Research Summit. And read OPM's blog about the Summit.